Our boat is owned and captained by Wayne Volkema. Wayne has been fishing the waters of Lake Michigan since he was a child. Growing up in the Onekama/Manistee area, Captain Wayne is familiar with the hot spots for some of Michigan's finest king salmon, coho salmon, lake trout, brown trout and steelhead. Wayne enjoys hunting when he is not fishing, loves fishing when he is "Knot Hunting", which is how we named our vessel. The captain is very passionate about the out of doors. When not in the woods or in the water, you can find Captain Wayne spending time with his wife and two children on their hobby farm, preparing for the hunting season, in Kaleva, MI. Captain Wayne has been fishing with First Mate Ken Falk for years. The two have been friends for more than 35 years and fishing buddies for the entire duration. Ken has been a first mate aboard Knot Hunting, and now Knot Hunting II, since before she was licensed and is a great fishing partner for your Captain. Ken works in and is involved in the goings-on of our community. He spends his free time (well, when not fishing!!) with his wife and three amazing boys in the Onekama/Manistee area. As an active member of the community, Ken is involved in area athletic programs and community organizations. Gregg Bennett is not only a great fisherman and friend, he is also the Captain's brother-in-law. 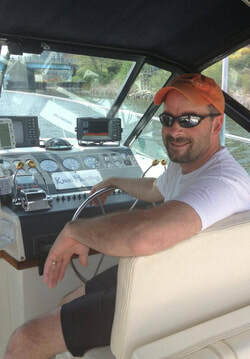 As a high school teacher, Gregg enjoys his summers "off", helping to navigate the waters of Lake Michigan. Gregg has been fishing with Wayne for a number of years and has known the trade since before the boat was licensed. Gregg teaches at Manistee High School and has been a wonderful athletic coach and mentor to the youth of Manistee County. When not fishing, or hunting, or coaching, or teaching, Gregg spends time with his wife and two beautiful children.